He was Grand Duke Michael Alexandrovich, the tall, handsome brother of Tsar Nicholas II. She was Nathalie Wolfert, the extraordinarily beautiful daughter of Moscow lawyer, and wife of a Guards officer - tha man for whom she had divorced her first husband, a musician. For Grand Duke Michael it was love at first sight - a passion that would never fade, and which lead to disgrace, cruel humiliation, and banishment. But as one of Natasha's admirers would say, "for the sake of a woman like her, a man could forget and give up everything". Michael and Natasha is one of the greatest love stories of all time; much of it is told in their own words, for they left behind hundreds of hitherto unpublished letters in which they reveal their joy as well as their despair - with Natasha treated as a criminal, he as a madman. Trailed across Europe by the Tsaräs secret police, the dreaded Okhrana, Michael and Natasha were teh talk of London, Parais, Berlin and Vienna, as well as of St. Petersburg and Moscow. 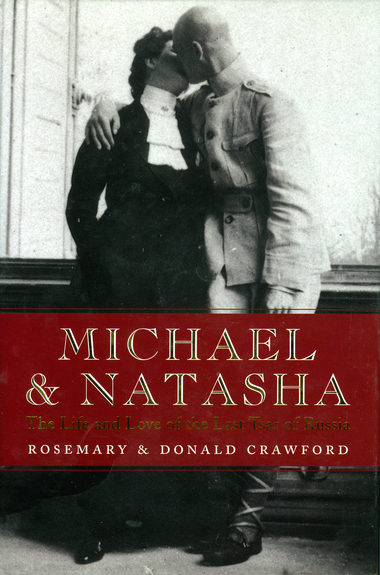 Michael and Natasha is an outstanding romance, a compelling historical drama, and in the end a terrible tragedy. It is a story no fiction writer would dare to invent.